Staff Selection Commission (SSC) has published today marks of Combined Graduate Level (CGL) 2014 Tier-I exam. CGL 2014 Tier-I exam was held on 19th and 26th October, 2014. The result of Tier-I exam was declared on March 5, 2014. SS has already announced to conduct CGL 2014 Tier-II exam on 11th & 12th April. Now finally they released the CGl 2014 Tier-I scores. If you are unable to check your CGL 2014 Tier-I marks, drop your Roll Number here as comments. We will intimate your scores. 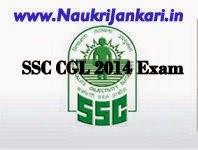 3 comments for " Marks/ Scores of SSC CGL 2014 Tier-I exam published "
We need Roll No. to view your marks. Have you your CGl Ticket Number?